We have had quite a few customers not follow the reset instructions correctly and end up locking themselves out of the padlock. If you are not technically minded please do ensure you ask someone to help you set the code in the first instance or attempt to set a very simple code first as a trial so you understand the procedure well. To view and print a guide to re-setting this padlock please download the PDF here. This the worlds fastest padlock using directional movements instead of a key or combination. Don't be fooled into thinking this is a novelty item by its innovative design. 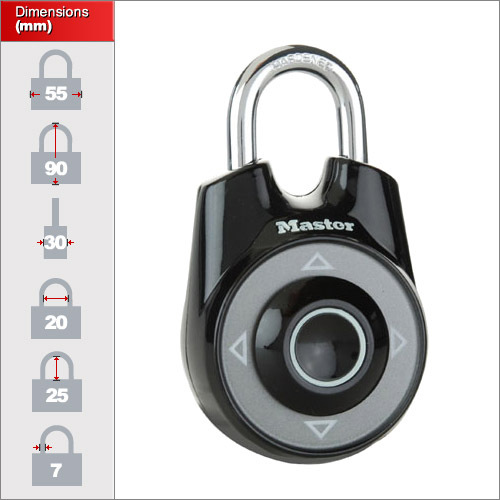 It is still a highly secure padlock using a 7mm hardened steel shackle, a solid 55mm body and anti-shim technology. However, please note that this is not an all-weather padlock and should not be exposed to rain, grit or salt water. 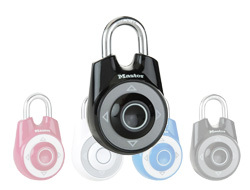 To see this padlock in action please see the Masterlock Video here. Be absolutely sure to watch this video before you try and set your code! There is only one size in this model but we do offer it in 2 different colours. Black and white. Please use the drop down menu above to select a different colour. Since this padlock does not use numbered dials it is very quick to operate. It also means that it is fantastic for low-light conditions, by workmen wearing gloves or people with eyesight difficulties. Please note that due to a highly complex mechanism this padlock would not be suitable for regular exposure to rain or water.